Born in La Plata, Argentina, he has made an important international work as organist, harpsichordist, pianist and composer. He played many concerts in Italy, France, Belgium, Germany, Spain, United Kingdom, Ireland, Switzerland, Austria, Hungary, Poland, Romania, Bulgaria, Russia, Denmark, Norway, Finland, Mexico, Ecuador, Uruguay and in the USA, a lot of times, as well as in the main Argentinean cities playing as soloist or with prestigious orchestras. 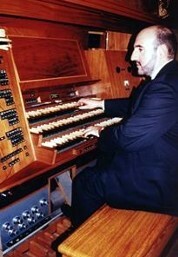 He was Organist of La Plata cathedral for ten years (1976-1986). He is founder fellow of the "Ensemble da Camera Arcangelo Corelli", dedicated to the study and diffusion of the baroque music and Director of La Plata Catholic University Law School "Schola Cantorum". His compositions for different ensembles have been played by prestigious performers in many countries. He also composed film and incidental music. A special reference deserves the original music written upon request of the choreographer Jorge Sansinanea for the ballets "La Passione" and "La Natività", both performed by first ballet dancer stars of the Teatro Colón of Buenos Aires on the monumental La Plata cathedral staircase, receiving great appreciation from the public and from music reviewers. As a completion of his humanistic education, he is graduated in Law at the National University of La Plata. At the present time, he lives in Gera Lario, on Lake Como, Italy, where continues his activity as concert-master and composer.